Irish coffee was first brought here by a travel writer, Stanton Delaplane, after he tasted it in a Shannon Airport in Ireland. After working with the Buena Vista Cafe in San Francisco, the coffee began being served on November 10th, 1952. Before the bar started serving the classic Irish drink, the owners worked through the night trying to recreate the floating cream on top, and nearly passed out while doing so. After seeking help from the city’s mayor, George Christopher, who happened to own a dairy, they decided that cream aged for 48 hours or more was perfect for floating atop the drink. The drink gained popularity as the writer continued to mention it in his column, and the love of the drink spread. 1. Brew coffee. The stronger, the better. 3. 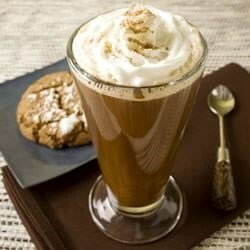 Top with whipped cream and a sprinkle of nutmeg.